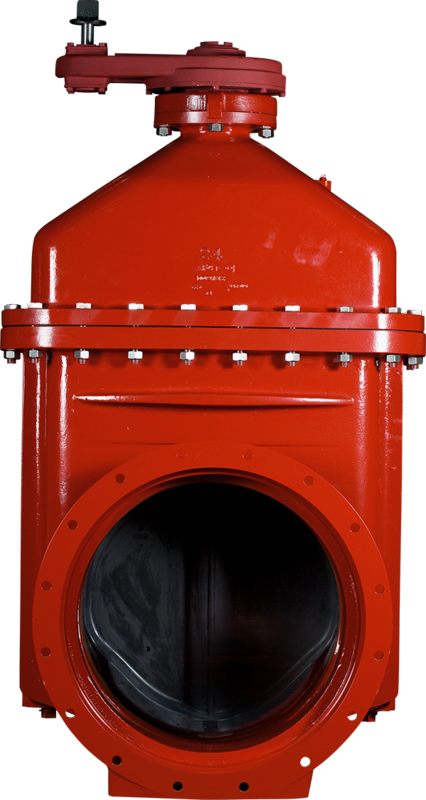 AMERICAN’s 14"-48" Series 2500 ductile iron resilient wedge gate valves are suitable for use in potable water, sewage and fire protection systems. These valves have a rated working pressure of 250 psig with zero leakage. The waterway is clear and unobstructed. Single-gate construction. Double-disc gate valves have multiple parts that can seize together. Bypasses, rollers, tracks and scrapers are not needed. The ductile iron body and bonnet provide superior strength and allow a pressure rating of 250 psig. The strength of ductile iron is more double that provided by gray iron. This added strength and higher pressure rating are provided in a compact, lighter design. The Series 2500 is pressure rated at 250 psig to account for typical pressure variations and surges. Both UL and FM require that we consistently manufacture and test our valves in compliance with their stringent requirements. Our facilities are subject to periodic inspections to assure we are in compliance with their standards. The Series 2500 gate valve is Certified in all sizes as complying with NSF/ANSI 61 and NSF/ANSI 372, which exhibit compliance with the U.S. Safe Drinking Water Act. Sealing the lubrication chamber is a series of O-Ring stem seals. The two O-Rings above and one below the stem thrust collar help to isolate the lubrication chamber. A fusion-bonded epoxy coating is electrostically applied to the interior and exterior of the valve body to help ensure corrosion resistance for a long service life. The coating is applied to all ferrous surfaces after the valve body is shot-blasted clean. Thrust washers are located above and below the stem collar to reduce operating input torque and assist in trouble-free operation of the valve. All 14"-66" valves are provided with integral lifting devices, which allow the valve to be properly handled without lifting it by the operating nut. Every valve is seat and shell tested after assembly to ensure its rated performance and that the seating mechanism is leak-tight. The body to bonnet gasket utilizes a unique dual sealing design which incorproates the reliabilty of a flat gasket and an integral pressure energized O-Ring seal. Helps to ensure zero leakage with low stem torques. Gearing allows for reduced torques and the ability to accomodate lower depths of bury.